An exploration of the Dark Web--websites accessible only with special routing software--that examines the history of three anonymizing networks, Freenet, Tor, and I2P. The term "Dark Web" conjures up drug markets, unregulated gun sales, stolen credit cards. But, as Robert Gehl points out in Weaving the Dark Web, for each of these illegitimate uses, there are other, legitimate ones: the New York Times's anonymous whistleblowing system, for example, and the use of encryption by political dissidents. Defining the Dark Web straightforwardly as websites that can be accessed only with special routing software, and noting the frequent use of "legitimate" and its variations by users, journalists, and law enforcement to describe Dark Web practices (judging them "legit" or "sh t"), Gehl uses the concept of legitimacy as a window into the Dark Web. He does so by examining the history of three Dark Web systems: Freenet, Tor, and I2P. Gehl presents three distinct meanings of legitimate: legitimate force, or the state's claim to a monopoly on violence; organizational propriety; and authenticity. 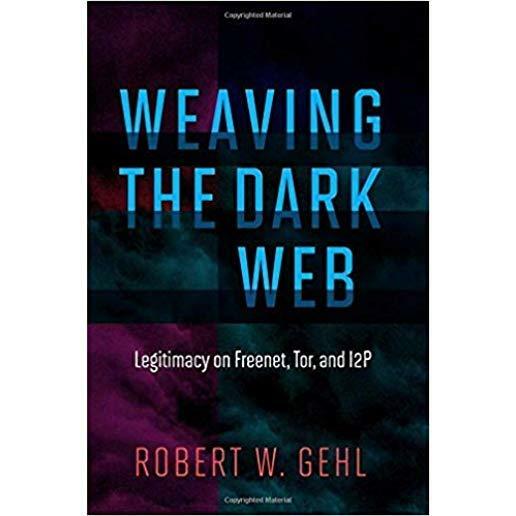 He explores how Freenet, Tor, and I2P grappled with these different meanings, and then discusses each form of legitimacy in detail by examining Dark Web markets, search engines, and social networking sites. Finally, taking a broader view of the Dark Web, Gehl argues for the value of anonymous political speech in a time of ubiquitous surveillance. If we shut down the Dark Web, he argues, we lose a valuable channel for dissent.